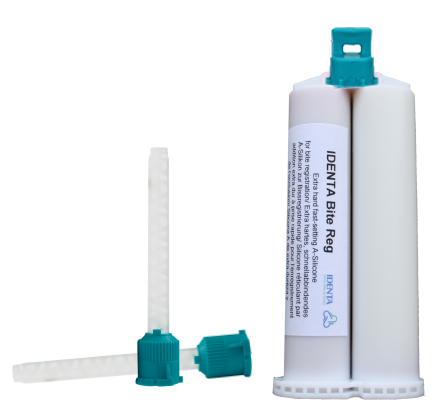 IDENTA Bite Reg is an A-silicone for bite registration with extreme final hardness that quickly sets. Highly thixotropic properties prevent dripping from the teeth and enable application in thicker layers. The special temperature-controlled setting formula eliminates time pressure during application and has an extremely short setting time in the mouth. Afterwards the registration can be removed without breaking or warping. IDENTA Bite Reg can be easily trimmed with a scalpel or rotating instrument and stays dimensionally stable.